Game makes fantastic salami as its flavour really shines through. 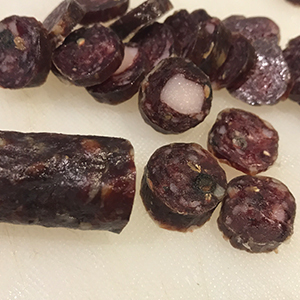 On our Venison Courses we love to make venison salami to show our guests how to preserve meat using techniques that have sadly now been forgotten. There is something very special about eating charcuterie that you have made yourself. For our trip to the Game Fair we thought we would make some pigeon salami as pigeon is an abundant wild meat that is available all year round that we wanted to show case in our food demo. The recipe below will work for venison, rabbit and even squirrel if you want to give it a try. Mince the pork and pigeon on a course plate. Add the rest of the ingredients , mix and then put a third of the mixture through the mincer again. We find this gives the salami a lovely texture. When the ingredients are thoroughly mixed put the salami mixture into your sausage stuffer and pipe into skins. We like to use lamb casing for our game salamis. Ferment at room temp for 1-2 days then hang out in a cool dry room to dry out. The salamis are ready when they become firm to the touch. As a guide they should have lost around 1/3 of their pre hanging weight when ready.